One of the wonderful advantages of living in Southern California is accessibility to fresh produce. (I especially appreciate this after spending 3 1/2 years in the midwest.) We have access to a year round quaint farmers market just down the road from our house. I love strolling the 2 aisles that make up our farmers market on Sunday mornings. Though the market is small, there is a wonderful selection of vegetables, fruits, herbs, fresh eggs, bread (vegan), cheese, fresh pita and hummus and a variety of other vendors that I have yet to purchase from. Our market even has a "worm wrangler" (who also sells Gouda cheese by the way)! I guess the worms are supposed to help your garden? One of these years I'll have to try it out. My garden could use a little somethin somethin! This Sunday asparagus made its first public appearance at our market. It was so fresh and perfect. I immediately thought of this recipe when I saw it. 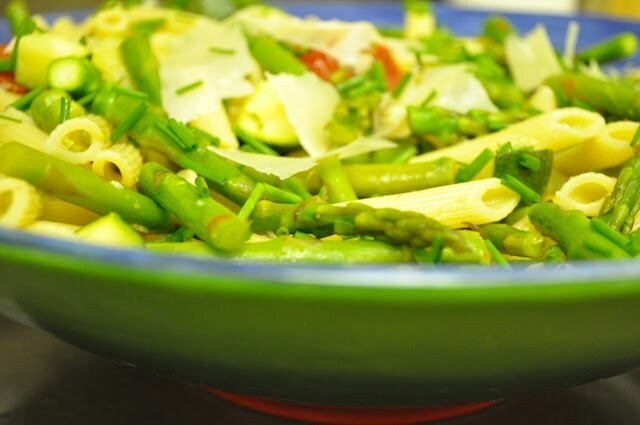 Last year I came across Giada De Laurentis making Penne with Asparagus and Cherry Tomatoes on her Everyday Italian show. Initially I was hesitant to make it...the simple ingredients seemed a bit boring. I'm use to pasta dishes that are all about the sauce. Luckily I got over my lack of sauce phobia, because this pasta dish is all that and then some! Simple does NOT mean boring. You have to use the freshest ingredients for this dish to really sing. 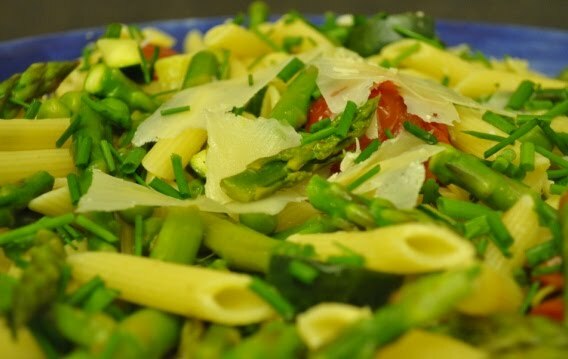 The hint of minced garlic intertwined with freshly cooked (slightly crisp) asparagus, fresh peas, zucchini and cherry tomatoes, is so simply delicious! Giada's recipe does not call for zucchini, but it blends in seamlessly. The chicken stock adds a level of flavor and creates the base of a light sauce (and keeps your pasta from drying out). I didn't have fresh basil this week (critters ate the plant I put in the ground about a week ago), but I did have some fresh chives....the only edible item growing in my garden at the moment. The chives worked out nicely. I recommend using fresh herbs (not dried) in this recipe (flat leaf parsley would be nice as well). The cool part about the dish is there IS a hidden sauce....those cherry tomatoes ready to burst out of their skins break up and release all their tomato goodness in with the chicken stock base. Voila! Light tomato sauce. Add in freshly grated Parmesan (use the good stuff) and the masterpiece is complete. A couple of quick notes. Generously salt your boiling pasta water and don't rinse the pasta when you drain it. 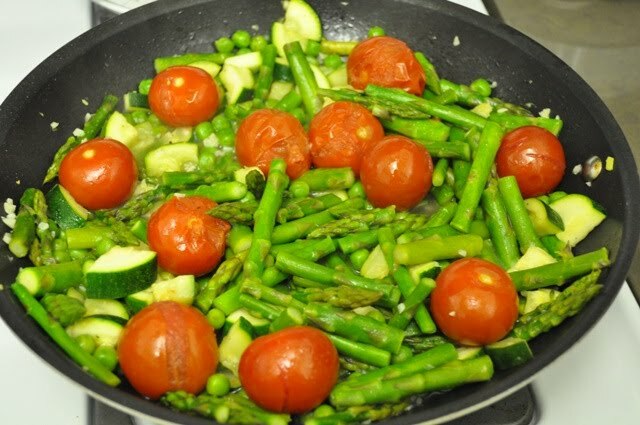 Avoid overcooking the vegetables. If you can't get your hands on fresh shelled peas, frozen are good second choice. Cherry tomatoes weren't available so I used a larger variety. Hubby and I had this for dinner 2 nights ago and he said he forgot how good this dish was. So thank you asparagus! We look forward to several more appearances at the market in the weeks to come. In a large saute pan, heat the oil over medium-high heat. Add the garlic and cook until fragrant, about 1 minute. 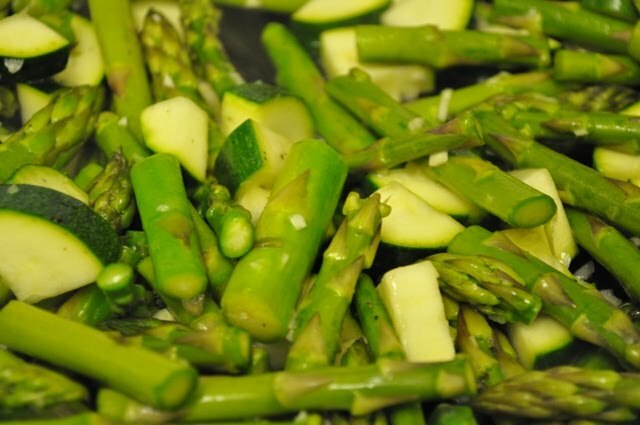 Add the asparagus (and zucchini) and season with salt and pepper, and cook for 3 minutes until slightly soft. Add the cherry tomatoes and peas. Cook for 2 minutes. Pour the chicken stock into the pan and bring the mixture to a simmer. Cook until the tomatoes start to burst and the stock is reduced by half, about 3 minutes. A Gym Membership and Hot Mess Meatballs!